If you are using selenium webdriver as automation tool to test software web application and wants to create selenium webdriver data driven framework from scratch then follow bellow given steps. 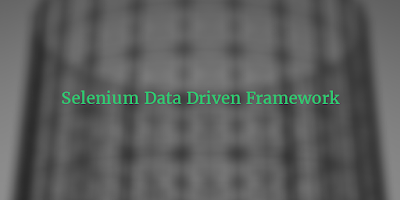 It will guide how to create data driven framework in selenium webdriver step by step to test software web application. Peoples are using different frameworks like keyword driven framework, data driven framework, hybrid framework and POM with selenium webdriver to test software web application. Which framework to use is depends you software web application type. If you are testing software web application where need to use very large data in automation test process then you can use data driven or hybrid framework. 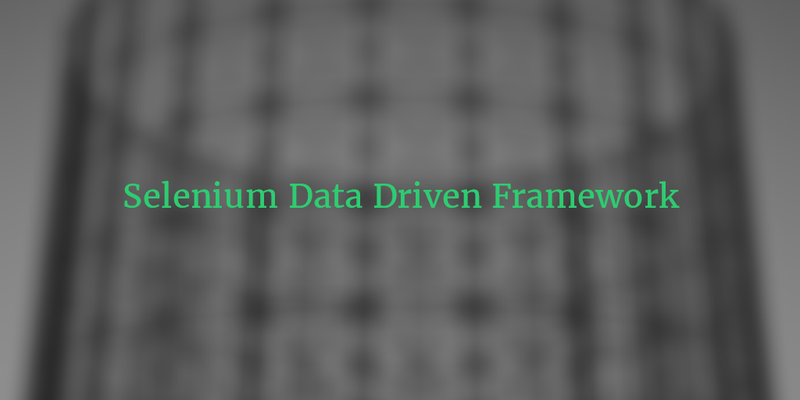 Read Selenium WebDriver Tutorial PART-1 and PART-2 before data driven framework creation. STEP 1 : Create Workspace And Project For Framework. STEP 2 : Creating Project Structure For Framework. STEP 3 : Download Required Jar Files. You Can Download All Required Jar Files From This Page Too. STEP 4 : Add jar Files In Project's Build Path. STAY TUNED :).. MORE STEPS ARE COMING SOON.. It will support only .xls files as Input data feed. It will use Apache POI API to read data from .xls files and write results In .xls files. It will use TestNG-XSLT Reports to generate results reports In HTML format. You can feed multiple combinations of test data for executing single test case. Example : Validating Log in form's username and password fields with different sets of data. You can set Test suite execution mode (Test Suite To Be Executed or Not) In .xls file. You can set Test case execution mode (Test Case To Be Executed or Not) In .xls file. You can set Test data execution mode (Test Data To Be Executed or Not) In .xls file. Reporting test case execution results (Pass, Fail or Skip) In .xls file after test case execution. Reporting test data execution results (Pass, Fail or Skip) In .xls file after test data execution. It will use Log4j - Apache Logging Services to generate execution log In applog.log file. Easy to maintain software web application's web page elements as It will use object repository to fetch web page element. Easy to understand, maintain and integrate with any software web application's test process. selenium webdriver, selenium webdriver framework, selenium framework, selenium webdriver tutorial, framework in selenium, selenium automation framework, selenium testing, automation framework, selenium testing framework, selenium automation, selenium test framework, framework for selenium, selenium webdriver, webdriver. can you also provide tutorial of selenium with jenkins. At present, I do not have any tutorial on selenium with jenkins. Great work Aravind....!!! Very helpful for beginners like me...Thank you so much... Plz keep on updating...nice way to learn from you...God Bless you..!!! you have done such a great job. It helps a lot for people like us who are completely new to automation. Please provide guidelines for framework development. Click on Steps link to go to tutorial page. Excellent blog..very helpful for learners. where can i get the complete code for data driven testing? Can you show us an example on how to write test result to output excel file, it is because in a test case, I have many items to verify/check and write the test result & print message into Output excel file. looking forward on your tutorial on this features, thank you. Do you have tutorials for Hybrid Framework ? This is hybrid framework, modular + data driven. Great work .. really .. You have talent and patience .. I have been giving seminars in my company.. but this is the perfect way of teaching. Aravind can you provide tutorials for keyword driven framework. Good Material for references. Thanks Aravind. Keep posting new topics. Hi Aravind, Appreciating your work from the bottom of my heart!!! Really nice blog and appreciate your helping nature and giving detail explanantion of the framework from scratch.If possible can you please help doing it using Cucumber Framework as well. Very good Blog Aravind. Can you please more blog for keyword framework and hybrid framework. Thank you for the all the tutorials...well explained..very helpful!! Thank you for all the tutorials..well explained..really helpful!! Appreciate it..
Nice article..suppose we have 200 testcases Do we need to use 200 sheets for reading the inputs right?Isn't that going to be tedious task? Thank you so much for this wonderful blog. Many times I was stuck in setting up environment and I was never able to move forward. Your blog helped me in understanding framework and actually able to automate different scenarios. I can not thank you enough and please consider this as my gratitude for your support to the community. can you provide apache POI tutorials. which are very helpful go build advanced automation framework.